On behalf of the Natalia Jacir de Siman Family, Mr. Jose Eduardo Siman, Mr. Teofilo Siman Jacir and Mr. Felix Siman Jacir were invested as Legacy Patrons of the Bethlehem University Foundation. The Family was recognized for its generosity in establishing two endowed scholarships at Bethlehem University. 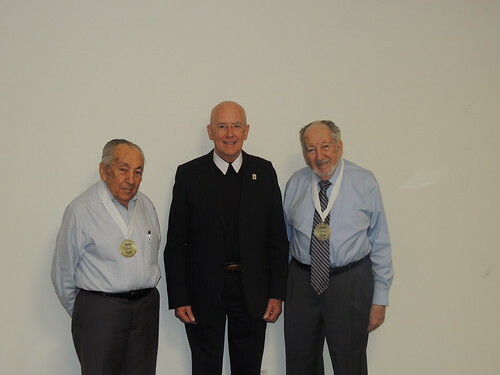 Brother Peter Bray, Vice Chancellor of Bethlehem University, and Mr. Isaac Sahhar, Assistant Vice President for Advancement, went to El Salvador where Brother Peter presented the Legacy Patron Medallions to Mr. Teofilo and Mr. Felix at a private family gathering. The title of Legacy Patron is bestowed upon individuals or couples who have generously supported the work of both Bethlehem University and the Foundation over the years and those who have contributed generously to scholarships, endowments, or major projects of the University.